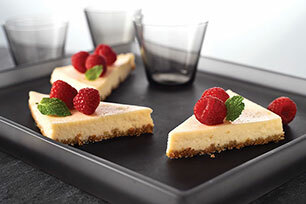 Our Greek Yogurt Cheesecake recipe has the tang of Greek yogurt and the creamy goodness of PHILADELPHIA Cream Cheese. Sprinkle graham crumbs onto bottom of 13x9-inch dish sprayed with cooking spray. Beat cream cheese, sugar and vanilla in large bowl with mixer until blended. Add yogurt; mix well. Gradually beat in whole eggs and egg whites, mixing after each just until blended; pour into prepared pan. Bake 55 min. to 1 hour or until centre is almost set. Cool completely. Refrigerate 4 hours.